Sea of Greed begins in 1968 with a joint French and Israeli research mission gone wrong. The Minerve, a French submarine, sinks, taking with her the research team's findings. In typical Cussler fashion, the reader does not yet know what this research is, nor how it will impact the plot, but knows it will play a crucial role in the story. Fast-forward to the present, and Kurt Austin, the leader of the Special Assignments team of NUMA (National Underwater and Marine Agency), and his partner Joe Zavala, appear at the site of a massive oil rig explosion in the Gulf of Mexico. After rescuing the survivors, Austin and Zavala realize that something is very wrong. They observe fire burning underwater, a flame that apparently requires no oxygen. Austin has never seen its like. "He looked below the surface but the fire extended downward as far as he could see . . .
'This isn't oil or natural gas,' he mused. 'No idea,' Kurt said. 'Something tells me we'd better find out.'" Before they can delve into this mystery, Austin and Zavala are called to Washington to receive a special assignment from the president. The president reveals that the world's oil supply is diminishing rapidly. Abundant oil fields are drying up. The stock market is already experiencing the effects, and once the word gets out, the ensuing panic could cause the world's economy to spiral out of control. It's up to Austin and his team to solve the mystery. The trail leads to billionaire environmentalist Tessa Franco, who has developed an alternative energy fuel cell that is sure to be in demand in the absence of crude oil. Working with Franco is Arat Buran, a genetic engineer who also heads an oil consortium. The reader meets the pair very early in the book and is immediately informed that these are, indeed, the villains, and the details of their plot are immediately revealed. By sabotaging the world's oil supply, Franco hopes to break the world's dependence on fossil fuels and replace oil with her own energy source, while Buran, who himself owns oil fields, will control the remaining clean oil. "The requirement is for a long-term, sustained rise in prices. One that would make the Consortium the most powerful oil cartel in the world. And simultaneously allow your company to become the largest alternative energy firm in the world." The NUMA team discovers that the pair are indeed responsible for the crisis, utilizing a rare bacteria which feeds on crude oil, and the solution lies with the sunken French submarine. The plot moves along at a rapid clip as Austin and team must find the lost submarine and the research it carries in order to reverse the effects of the bacteria. Franco brings massive resources to bear against them, and it will take everything Austin and his team has to survive and save the world. 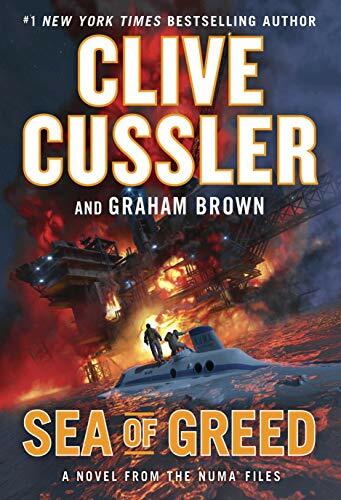 Sea of Greed is standard Cussler fare. The plot is linear, without twists or surprises. There's no mystery or suspense regarding the villains and their schemes. And it's a foregone conclusion that the heroes will save the world. A Cussler novel is like a ride on a roller coaster: it's no secret where things will start, where they will end, or what's going to happen along the way, but the ride is thrilling nonetheless.